Ultimate Fighting Championship (UFC) Lightweight strikers Lando Vannata and David Teymur battled last night (March 4, 2017) at UFC 209 inside T-Mobile Arena in Las Vegas, Nevada. In his two performances prior, Vannata proved himself as an absolute must-watch prospect. Last night, the “Groovy” athlete was looking to bring home another signature knockout victory. In the other corner stood David Teymur, an experienced kickboxer ready to capitalize on any mistake from his opponent. He may have been overlooked in the build up, but the Swede definitely came into this match up ready to throw down. What a beautiful brawl it was. In this match up of strikers, Vannata struck first. Early on, his wild kicks and explosive striking were finding a home, stunning his opponent a bit. “Groovy” found his range quickly, which is what allowed him to give off so quickly on his veteran opponent. However, Teymur wasn’t going anywhere. He began to find a home for his body kicks and counter punches, which did an excellent job of slowing his opponent down. In more controlled exchanges, Teymur began to land more effectively, winning exchanges in the latter half of the round. Both men landed some very hard strikes in the opening round, but the fight was just getting started. In the second round, Vannata pursued his opponent around the octagon while Teymur looked to counter. Both men were a bit tired after their relentless exchanges in the first, but that had little effect on either man’s volume. Instead, they were both far easier to hit. While both fighters had their moments, Teymur landed the biggest shots of the round. In particular, Teymur cracked his foe with a superman punch, and he also landed a half dozen knees to the body when the fight moved to the clinch. Nevertheless, the fight was up for grabs in the final round. The third round continued to play out at an incredible pace. Each time one man landed, the other quickly responded with big punches. Vannata opened the fight with a pair of big right hand counters, while Teymur smashed his opponent’s inside leg and body. Despite the abuse both men were absorbing, they continued to throw constantly. Vannata’s endless pressure allowed his opponent to land a decent amount of takedowns, but he could never keep Vannata pinned to the mat. Instead, the fighters returned to the feet, where they continued to brutalize each other. At the end of three rounds, the judges awarded Teymur the unanimous decision. While Teymur’s professional kickboxing experience was known before this bout, he’s never looked quite this good on the feet before. His range control was masterful, as he constantly punished his opponent with kicks at range, counters in the pocket, and brutal knees whenever the pair found themselves in the clinch. Over time, Teymur’s more efficient approach allowed him to land the better blows. Vannata never gassed out, but he was forced to take time to recover in the middle of rounds, whereas Teymur remained consistent and landed big punches while Vannata recharged. Additionally, Teymur’s reactive takedowns were brilliant. They may not have been perfect shots from a wrestling point of view, but Vannata was fatigued and damaged from the previous 10 minutes of war. The takedowns didn’t have to be perfect to have an effect, as they kept Vannata from really finding his range. After the biggest win of his career, Teymur deserves a shot at a ranked opponent. He’s won three straight inside the Octagon, and each was an impressive performance. Vannata definitely came up short here, but damn if he still isn’t one of the most interesting fighters to watch moving forward. The prospect was out-worked by a true striking veteran, but he never once took his foot off the gas. Instead, Vannata was attacking and adjusting to the final bell, and he showed off some incredible durability on the way. Don’t give up on “Groovy Lando” just yet. 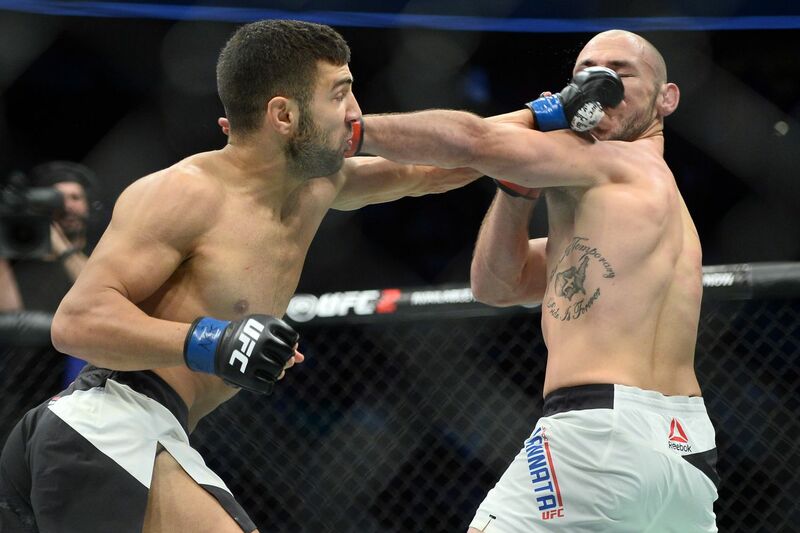 Last night at UFC 209, David Teymur put on the best performance of his short career. Can Teymur work his way into the title mix? For complete UFC 209: “Woodley vs Thompson 2” results and play-by-play, click HERE! Fightweets: Has Conor McGregor damaged his brand?